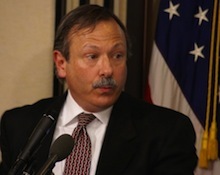 He is part of the American Holocaust denial movement, reviewing a book by British denier David Irving for the racist Occidental Quarterly journal, organizing a 2005 speaking event for Irving, and giving a speech at the denialist Institute for Historical Review, according to the Institute for Research on Education & Human Rights. Gemma’s influence on the Constitution Party has been, thus far, hard to gauge. The group’s mission statement and its website look unchanged. But it’s hard not to wonder, when an already radical group brings a longtime racist and anti-Semite like Peter Gemma into a key leadership position, just what the future can hold.